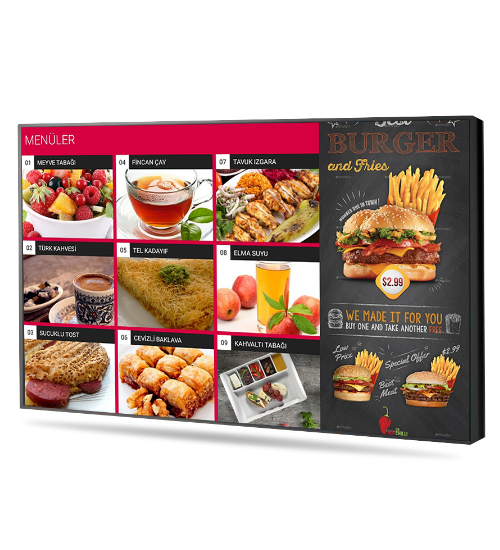 With Menulux Signage & Menuboard you can easily update your prices via Menulux POS system. 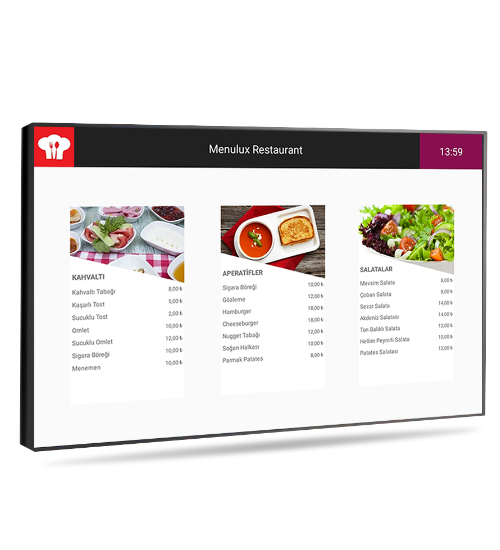 Menulux cloud computing platform allows menu and price changes are instantly transferred to the menu boards. You also have application updates and new features immediately. Menulux Signage & Menuboard, restaurants, cafes, patisseries, coffee shops, etc. it is suitable for every workplace. Easily enhance your visual menu experience with Menulux. Modern, high quality and professional service understanding with Digital Signage and Menu Board! 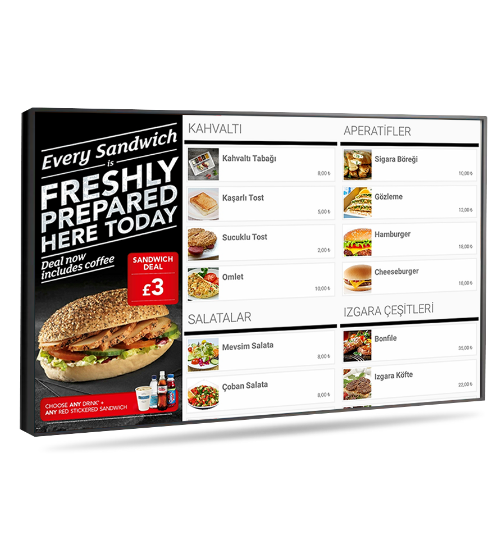 Digital menuboard systems, which are widely used in restaurant and fast food companies, offer a chance to change menu prices and visuals quickly and actively, to play videos about the company or product beside the menu. With moving content and visuals, you can attract your customers and increase sales. Mostly in the food court, in fast-food and self-service restaurants, you can reflect on your customers very cheaply and practically the advertising, campaigns and other promotions, which are very difficult to reflect to people, thanks to the restaurant menu screen. You can ensure that more people choose you by reflecting the appetizing images of served meals on the screen. The menu can include images of the preparation process, so you can show the reliability and quality of the food and drinks presented to the customer. With Menulux Digital Menuboard you can easily manage the changes in all the branches from the center. Changes can be easily managed even when they are at home, when they are by business owners or managers. 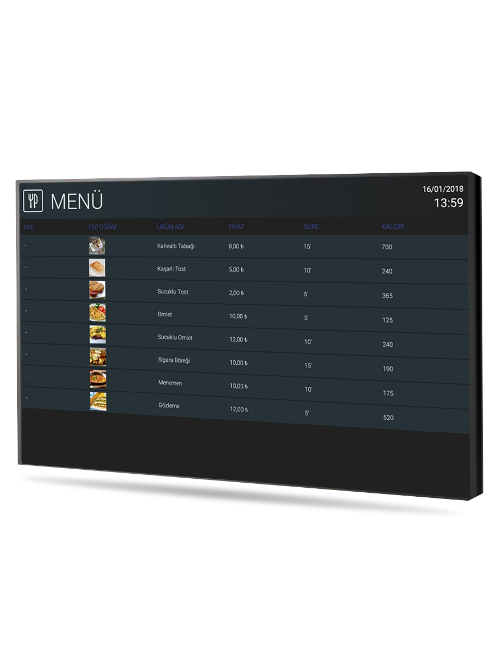 With Digital Menuboard, you can display more menu contents at the same time instead of fixed menu contents. You can completely eliminate production, transportation and installation costs of traditional methods such as banners and fixed panels. If you want to campaign for the products you want for your customers at specific time intervals, you can update your menus immediately. Which can easily accomplish this with a few clicks. Your customers may be curious about the amount of calories in food and beverages in line with their daily diet plans. You can also provide quality, honest and professional service to your customers by entering nutritional information with the digital menuboard. By integrating Menulux Menuboad with any social media channel, you can provide interactive communication between your customers and your brand. The digital menuboard adds value to the ambiance with its elegant look and good design. It makes your menu look more remarkable and memorable. Start trying Menulux Signage & Menuboard app by downloading from Google Play store. We have discovered an innovative way to visually present our menus, receive mobile orders and feedback with Menulux Pocket digital menu and mobile ordering system.